The making of Penguin Hops, a beer collaboration between Revolution Brewing and the Shedd Aquarium. 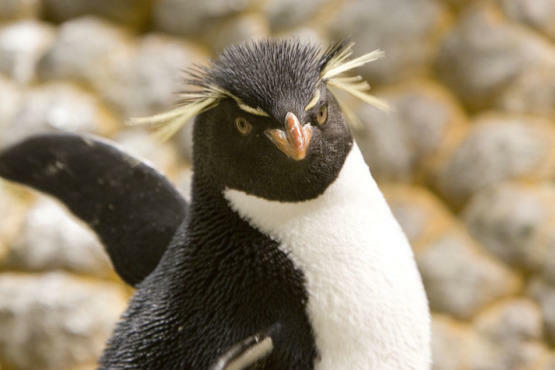 Rockhopper penguins inspired the name for Penguin Hops, the beer released at Revolution Brewery last week. As the name suggests, the hops used in the beer were grown in the garden of the Shedd Aquarium. The hops were grown throughout the four-acre garden surrounding the Shedd Aquarium. They were never really intended to be turned into a beer--they were originally planted simply to provide ground coverage--but head horticulturist Christine Nye saw an opportunity to bring the vision behind the sustainable gardens to a wider audience. So she started reaching out to breweries. Assistant Pub Brewer Marco Reyna with Christine Nye, manager of The Shedd's horticulture programs. Revolution started brewing Penguin Hops on November 2nd, 2012. The hops were firsrt planted at the Shedd Aquarium in 2006. Temporary office trailers placed in the garden had compromised the visual integrity of the gardens (read: made the gardens look like hell). Head horticulturist Christine Nye choose to plant hops because they're known to grow quickly, and would change the look of the gardens in short time. Revolution Brewery's Brewpub at 2323 N Milwaukee Ave. If it weren't for Revolution's second facility at 3340 N Kedzie Ave, Penguin Hops would have never happened--the Milwaukee Ave location is too overwhelmed producing Revolution's signatures to take on a side project. Having made only a 15-barrel batch, the staff of Revolution Brewery expect Penguin Hops to be gone within a few weeks. The first stage of the brewing process starts on Revolution's second floor, where workers mill the grains they will steep in hot water. Steeping the grains converts the starch into fermentable sugars. The result is a product called wort. The used grains from the malt are then picked up by a farmer, who will compost them. Once the wort is created, workers transport the liquid into a kettle for boiling. Next, hops are added for flavor. Much of a beer's flavor and aroma comes from the oils in the hops, but since they are so volatile the brewing team decided to add hops at the very end of the process--that way, Penguin Hops wold retain the hops' aroma. After the boiling is complete, brewers run the wort down a pipe to recirculate it, creating a whirlpool. This forces all the hot pellets and malt proteins to form a cone in the center so the solids can easily be removed. Wort being run from the kettle into the fermenter. Marco Reyna (left), assistant brewer, and Will Turner, head brewer. "I produce wort," Turner says. "The yeast makes beer." Head Horticulturist Christine Nye enjoys a glass of Penguin Hops beer. "There hasn't been anything this exciting around the [The Shedd] since we had a baby dolphin," she said. The partnership between Revolution Brewery and The Shedd Aquarium didn't end at the creation of Penguin Hops. For every pint sold, $1 goes to support the aquarium's conservation initiatives. When they hear about Penguin Hops, the beer Revolution Brewing made with the Shedd Aquarium, most people probably raise their eyebrows, mutter a comment ("Interesting...") and go back to their day. But photographer Hannah Fehrman wanted to know more. So she delved into how the Shedd and Revolution got together, and put her findings in the slideshow above.